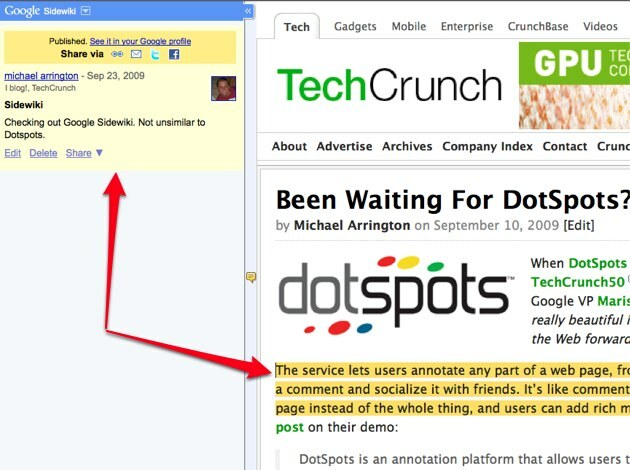 By 2001 web startup Third Voice, which let people annotate websites via a browser plugin, was done. Website owners just didn’t like the idea of people “defacing” their websites with comments they couldn’t control. But the idea has lingered (really), and now Google is taking a shot at their own version of the service. It’s called Sidewiki, and it just launched. Sidewiki is part of Google Toolbar (and it will be built directly into Google’s Chrome browser). Users activate the service by clicking on a button and a sidebar appears to the left of whatever website is being viewed. The user can then leave a comment on the entire page or a selected piece of text, and share the URL via email, Twitter or Facebook (stalwart Google partner MySpace is left off for now, but Google says they’ll add more partners later). Users can also embed videos into the Sidewiki. Other users can read and vote comments up or down. All those votes will create a user ranking for each individual that will determine where their comments fall on the Sidewiki. The higher the ranking, the higher comments appear. The goal, Google says, is to help move better content up and move spammy stuff to the bottom where it won’t be seen. Website owners who have claimed their sites always have the right to the first comment on any URL they control. Google says Sidewiki is absolutely separate from last year’s SearchWiki, and comments/votes won’t be aggregated. Will this work? It’s unlikely that websites will have the same visceral reaction today that they did to Third Voice a decade ago. And Google solves the chicken-and-egg problem nicely by building this into Toolbar. The real question is whether they can control spam, which has plagued SearchWiki. And I guess the other real question is, how long until they put ads in it? 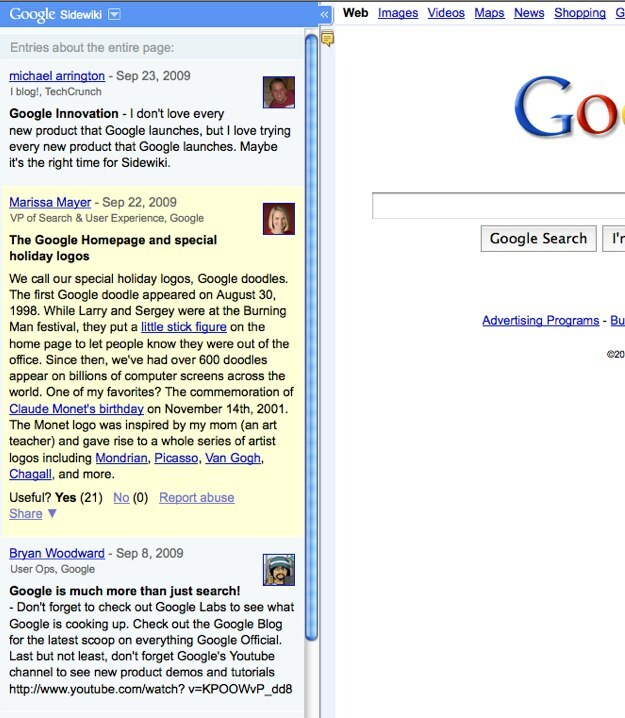 Google Toolbar users will be upgraded over the next several weeks automatically and offered the use of Sidewiki. Those of you who want to try it immediately can find the download link here. Google is also making an API available for developers to access and use the data.